With little doubt, Boguslaw Balcerak can play guitar. 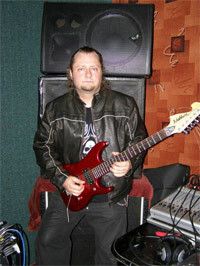 Crylord is the project and platform for this versatile Polish guitarist who performs in the neo-classical tradition. Blood of the Prophets is his debut on Lion Music (well known for signing major new guitar talent). Besides several of Poland's finest musicians, Balcerak is supported on lead vocals by three men who are quite familiar with neo-classical inspired heavy metal: Carsten 'Lizard' Schulz, Goran Edman, and Marc Boals. Additionally, the album was produced by King Diamond guitarist Andy LaRocque. 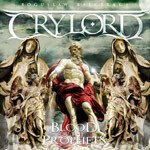 Balcerak and Crylord deliver solid melodic heavy and power metal driven by his fiery guitar work. Yet any axe slinger can rip up the fret board for a matter of record. But the real question is, can they do this in the context of well written songs? The answer for Balcerak and company is cautious affirmative. Blood of the Prophets, Grave of Love, Valley of the Dead, and Angel of Divine show inspiration beyond a clinic in guitar technique. Warrior's Moon or Behind the Walls of Sadness, maybe not so much. But Carsten Schulz steals the show on these anyway. However, for pure epic power metal and a double dose of fret angst, When the Time Has Come and The Healing Hands of Destruction offer a reasonable balance between guitar technique and song composition. Fundamentally, however, enjoying Boguslaw Balcerak's Crylord and Blood Of The Prophets likely depends on your interest and/or tolerance for neo-classical guitar technique. There's plenty of widdling and wiggling across the fret board here, and arpeggios abound. In the end, all this review stands on that opening sentence. Enjoying Boguslaw Balcerak's Crylord and Blood Of The Prophets likely depends on your interest and/or tolerance for neo-classical guitar technique. There's plenty of widdling and wiggling across the fret board here, and arpeggios abound.